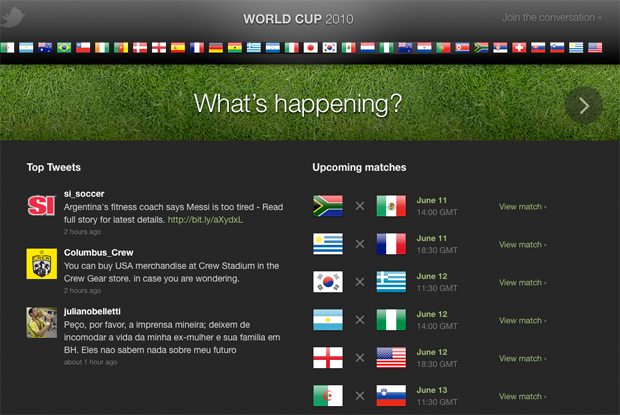 Twitter’s World Cup: Is Live-Event Chatter Part of Twitter’s Master Plan? If you haven’t had a chance to check out Twitter’s new World Cup site, do so now. It’s an amazing source of news for FIFA’s tournament–and perhaps a glimpse at how we’ll be socializing during events, in a Twitter-dominated future. The site provides helpful flags for each participating country, a list of upcoming matches, top tweets, and a what’s-happening-now button that takes visitors right to the soccer pitch, focusing in on games in progress, with custom-Twitter feeds for each match. During a match, tweets originating from each team’s home country flow face to face, so that you can get a sense of the trash talk. Imagine if Twitter branched this service out to other sports and tournaments–say, the NFL, NCAA March Madness, and the Olympics. The events could be designed just as the current World Cup site; branching the service out should be a no-brainer, and it’s an angle that apps such as Hot Potato have already tried to capitalize on. But with Twitter’s massive, skyrocketing audience, which just grew to some 2 billion tweets per month, the 140-character powerhouse may have found a new market to tap in the live-event arena.